Show your love for South Philly and its hometown Philadelphia Phillies with our Personalized Nameplate Framed Art decor. This premium print is nestled safely behind glass and comes ready to hang in a high-quality black horizontal frame you'll be proud to display in your office, home or fan cave. Specify the name you would like printed on this premium print — it can be a first name, last name or a nickname. 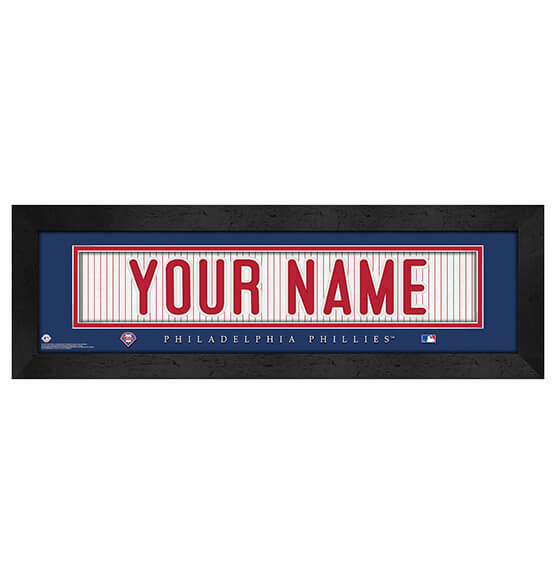 Ideal to give as a gift to any Phillies fan, to hang in a child's room or to add to your collection of Phillies memorabilia, you can't go wrong with this Philadelphia Phillies Custom Framed Nameplate!